3M 8233 N100 Respirator on Sale Today! The 3M 8233 respirator is well suited for those who want NIOSH's highest rated filtration efficiency in a maintenance free respirator. The 3M™ 8233 respirators provides a minimum filter efficiency of 99.97% against non-oil based particles. This respirator is an excellent choice for lead abatement, pharmaceutical manufacturing, welding, metal pouring and work involving OSHA substance specific particle exposures, excluding asbestos. It features the 3M Cool Flow™ Exhalation Valve, comfortable faceseal, adjustable straps, and lightweight construction. The 3M 8233 N100 Particulate Respirator is one of 3M's most popular N100 respirator. The Cool Flow Exhalation valve makes it a comfortable to wear for longer periods of time. If you're in need for a N100 mask then the 3M 8233 will work great. Recommended applications include foundry operations, grinding, petrochemical manufacturing, processing of minerals, and welding. Industries in which this respirator is commonly used include construction, general manufacturing, mining, oil and gas, and transportation. Fitted with a 3M Cool Flow™ Exhalation Valve, this respirator is ideally suited for work situations involving heat, humidity, or long periods of wear. The proprietary 3M Cool Flow valve is designed to release hot, humid exhaled breath quickly, helping to prevent an unpleasant build up of heat inside the facepiece - a significant cause of discomfort for respirator wearers. 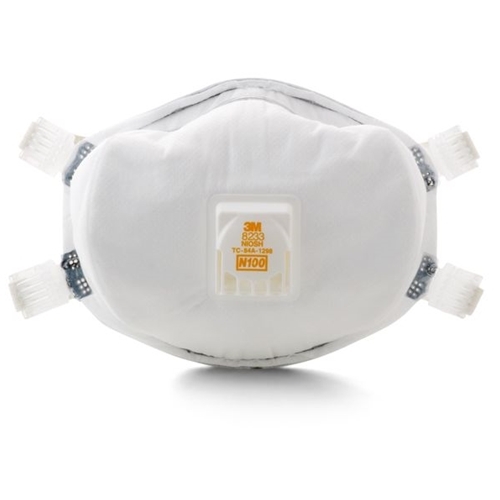 This particulate respirator is NIOSH (National Institute for Occupational Safety and Health) approved for environments containing certain non-oil based particles and provides N100 (99.97%) filter efficiency. Respirator helps provide protection against certain OSHA substance specific contaminants including lead, MDA, arsenic, and cadmium (excluding asbestos). Breathing hazardous particles can pose a risk to your health. NIOSH, a Federal government regulatory agency, has tested and approved the 3M Particulate Respirator 8233, which is designed to help reduce exposure to certain airborne particles. For more than a century, 3M has applied innovation and technology to improving our customers’ lives and supporting their business goals. Today the company, from its headquarters in St. Paul, Minnesota, serves industrial and commercial customers and consumers in nearly 200 countries. Personal Safety products, focused on worker safety, include respirators, hearing-protection products, air-monitoring devices, environmental-safety products, and comprehensive training programs. The 3M brand, across thousands of products, represents consistency, superior quality, and value.